Editor's Note: This is the second of a series of interviews with creators coming down to Austin for this year's STAPLE! Expo. Comment below to be entered in a contest to win one of five weekend passes to the convention! I got the chance to catch up with David Hopkins, a free-lance writer and scripter of comics via email. David he a guest at STAPLE! this weekend. Sometimes I think that it’s assumed that the writer and artist of a comic or graphic novel are one in the same, but usually comics are a collaborative effort, and quite a few folks will have their hands in one published work. Being an artist myself, I was really excited to talk to a man who works with the words that form the pictures, and to get a new perspective on the indie comic scene. DT Comics:You’ve collaborated with many different artists to create all kinds of comic work—what is the most exciting part of the collaborative process for you? What is the most frustrating? David Hopkins:The most exciting part of the collaborative process is when you first see your ideas take shape with your collaborator. It might be the character designs or the thumbnail sketches, or maybe even the first few pages, but at a certain point, the story is no longer mine. It becomes ours. Some artists are a lot more willing to take over. Others are more tentative. But when it happens, the story automatically becomes better. Artists can burn out. Personally, I've had a few burn outs as well. It's a grueling occupation. Even for successful comic book creators, the pay is unremarkable. I certainly understand why people burn out, but it's unfortunate. I've had a few projects die because of it. My priority is always with the well-being of my collaborator. They come first. If a project doesn't happen, then that's the nature of the beast -- but I want the relationship to stay intact. We can work on something else. DTC: STAPLE! Is all about celebrating indie print media, but there’s no denying we live in a digital age. What do you see in the future for independent print media, or even print media in general? DH:The large publishers, Marvel and DC, are always going to be dominant. They'll find a way to stay on top. They'll sell enough tooth brushes, action figures, and video games to justify the comic books. However, the mid-range publishers, the ones that pay on the back end "a percentage of the proceeds," they are in serious trouble. 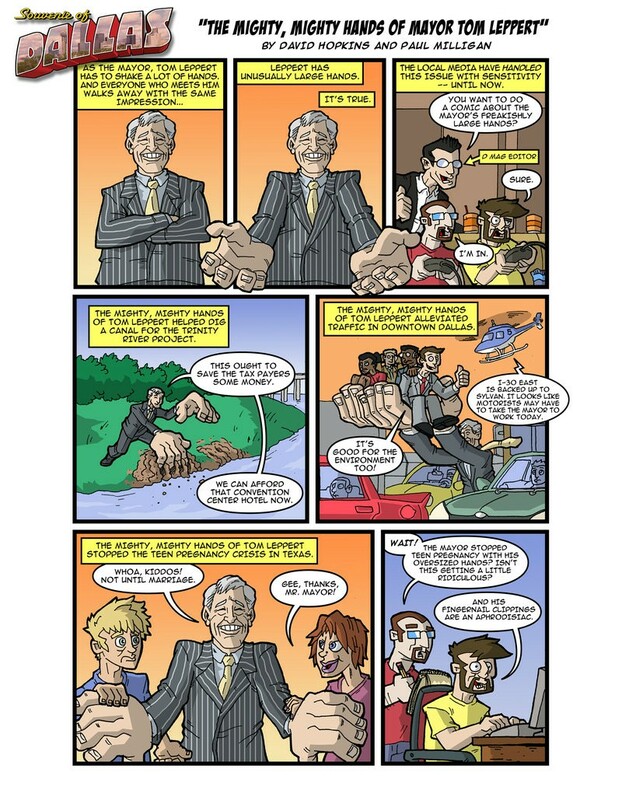 If I could make more money doing my project as a web comic, distributing it digitally on a smart phone or tablet, or using a print-on-demand company, why would I want to work through a traditional publisher or a traditional retailer? At a Dallas convention a few years ago, I had the owner of Lone Star Comics (a comic book store) tell me that he sells 50 Spider-Man comics for every one of mine. Actually, that estimate is probably too kind. More likely, he sells 10,000 Spider-Man comics for every one of mine. If I can sell directly to my readers, I cut expenses and I can survive off a smaller, more dedicated fanbase. I honestly don't know how some mid-range publishers are going to survive. Social media is networking the creators. They know what everyone else is getting paid, and they don't want to feel like a chump. They want to get paid too. Sadly, most mid-range publishers can't afford to pay their talent a living wage. That's scary. Additionally, if I have a few indie-friendly shops that support me, there's no incentive for me to play nice with the larger stores -- especially if they don't want me anyways. DTC: A couple of your works, “A Souvenir of Dallas” and “We’ve Never Met” are set in Dallas, and you also write for D Magazine. Do you think living in Texas, and especially Arlington, has influenced the rest of your work? DH:Not so much living in Arlington -- I've always considered myself a "son of Dallas." But yes, living in Texas has definitely influenced my work. 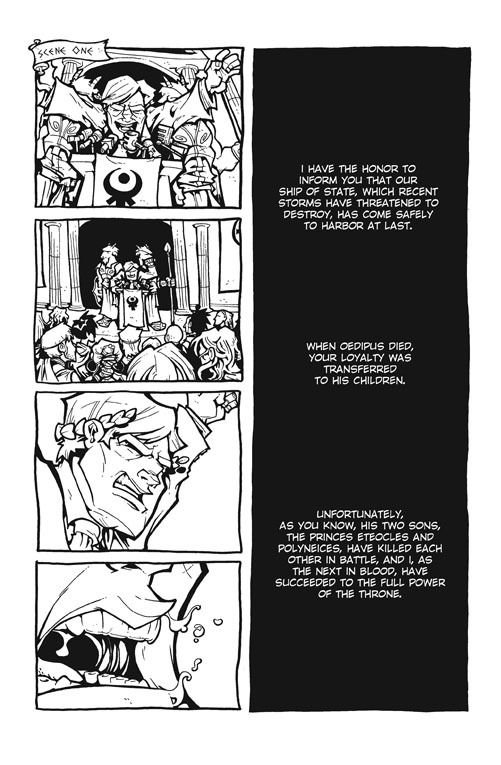 In fact, only two of my comics (EMILY EDISON and ANTIGONE) take place outside of Texas. I've lived here most of my life, and it's what I know. So many people have written "Texas" badly; FRIDAY NIGHT LIGHTS being one glorious exception. I try to bring something authentic to my work. DTC: Your work ranges from Horror to Historical to Slice-of-Life style writing, which is pretty impressive that you can span so many genres so well. Is there one kind of writing that you prefer? Yeah, that's been a blessing and a curse. Several years ago, I was very intentional about tackling different genres and subject matter with each project. I felt like it was a way to grow as a writer, and I truly believe it made me better. On the other hand, it's not good when you're trying to brand yourself. Publishers want to be able to say, "This writer is the best there is at THIS. If I want a good story about THIS, I go to this writer and no one else." I don't think I ever established myself as being the best at a particular genre. I had to prove myself with every new endeavor. Which genre do I prefer? I like family dramas, something with a large ensemble cast. Also, don't laugh, I scare easily (I can't stomach 90% of the horror movies out there), but I think I'm actually pretty good at writing horror. Brent Schoonover and I are working on a new horror project, and I can get dark. Real dark. So dark that one publisher wanted me to consider changing the ending, but I couldn't do it. The horror genre is about hitting hard, and I can do that. DTC: Consequently, as a writer of horror, how prepared do you feel for the zombie apocalypse? DH:I have a few baseball bats in my house that would be quite effective. My plan for the zombie apocalypse is to track down my gun-toting friends. I'll cash in a few favors. DTC: If you could give one piece of advice to us youngsters trying to make it in the indie print world, what would it be? DH: If you're going to fail, fail with your own ideas. Be ambitious. David Hopkins is a freelance writer — a regular contributor to D Magazine, Quick, and Smart Pop. He has also written comic books and graphic novels in a variety of genres. Dallas Observer recognized him as “Best Local Comic Book Writer,” and the American Library Association honored his work in their annual “Great Graphic Novels for Teens” list. For twelve years, he taught English and Creative Writing at Martin High School where he served as writing coach for interscholastic competitions. 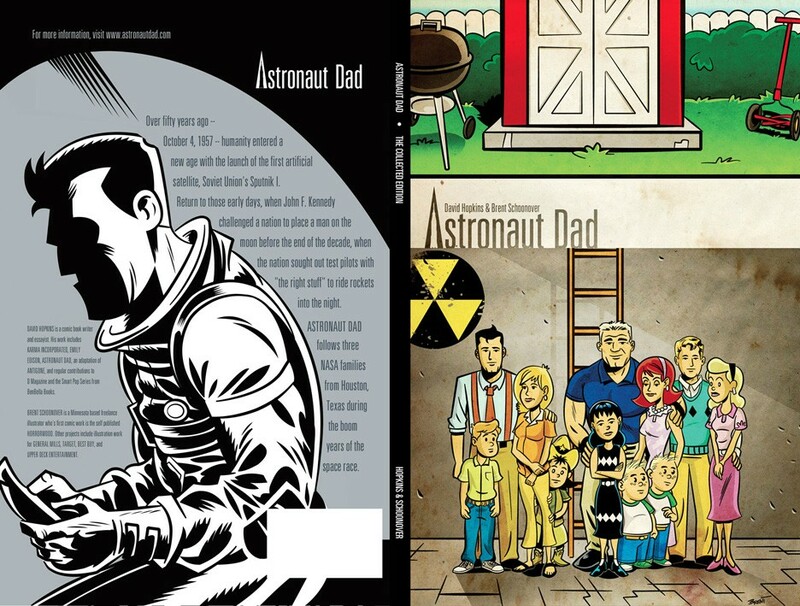 At STAPLE, Hopkins will be debuting the new editon of Astronaut Dad, a collaboration with Minnesota-based artist Brent Schoonover that follows three NASA families from Houston, Texas during the boom years of the space race.